For all treatments we make sure to give a thorough and accurate diagnosis to ensure that the patient does not incur any unnecessary treatment expenses. We will break down the cost of the treatment in sim ple step by steps to make the patient fully aware of what he will be paying and erase any doubts or worries. Any implant treatments approved and supplied in Japan are possible to receive here. *All fees required for CT, X-ray examination and other implants are included in the tables below. There is no need to worry about this implant being robust or fragile. Despite its lower price it is incredibly durable and long-lasting. This implant is versatile and possible to apply in a variety of unique treatments such as sinus lifts and GBR. The final super-structure is topped off with a finish of custom abutment + zirconia brown with cement adhesion or screw retainers. A long-established product and leading implant in the industry worldwide. These implants manufactured by Nobel Biocare’s strengths are its variety of versatile components. Due to its worldwide reputation it is guaranteed to be a consistent and reliable option for those looking long-term. Currently available products such as implants, superstructures, prosthetic teeth, anaesthesia, medicine and bone solidifiers are selected based on the customer’s personal, tailored requirements. There are other free benefits and services for those that choose this option. There is no need to worry about this implant being robust or fragile. Despite its lower price it is incredibly durable and long-lasting. 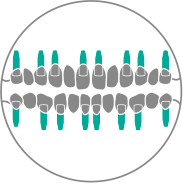 This implant is versatile and possible to apply in a variety of unique treatments such as sinus lifts and GBR. The final super-structure is topped off with a finish of custom abutment + zirconia brown with cement adhesion or screw retainers. A long-established product and leading implant in the industry worldwide. These implants manufactured by Nobel Biocare’s strengths are its variety of versatile components. Due to its worldwide reputation it is guaranteed to be a consistent and reliable option for those looking long-term. Currently available products such as implants, superstructures, prosthetic teeth, anaesthesia, medicine and bone solidifiers are selected based on the customer’s personal, tailored requirements. There are other free benefits and services for those that choose this option. *The above expenses include CT, X-ray examination, and all other expenses necessary for the implant process. *A warranty period of 3 years is guaranteed for super structures. 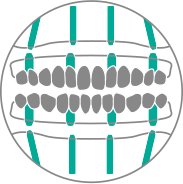 Implant Imperfusion Treatment The inner mouth area may suffer from implant related inflammation and perfusion issues. We treat such patients and although the procedure may differ depending on the severity of the condition, the cost is uniform. Full-on surgery is necessary in most cases. *All fees required for CT, X-ray examination, and other implants are included in the charge example. *Our All on 4 treatment has a variety of prices depending on whether patient wishes to have the simplest or most advanced treatment with extras such as aesthetic enhancements. The cost includes the whole of one jaw and it has 10 year warranty period.